Here is a quick little project to both brighten a gift and later can be hung on the tree. This is from the ProvoCraft Very Merry Christmas tag cartridge. It is the snowman and the associated background layer. Both are cut at 4″ tall. The “secret” to this quick and easy project is using heavy cardstock. For applications such as this, Paper Trey Ink’s cardstock cannot be beat. I cut one snowman layer in white, paper pieced in the scarf and facial features, shaded with Copics, and heavily applied glossy accents to the snowman (but did not cover the facial features or scarf). Cover the glossy accents with a extra-healthy dose of glitter and after about 10 minutes, press the glitter into the now tacky glossy accents. Here is the back so you can see the paper pieces. I placed the cut piece face up on the “scarf” paper and outlined the scarf. Then simply trim inside the lines and continue to trim until it fits. For the facial features, I just freestyled a cut from brown paper. I cut two background layers – one in the patterned paper and another in the Paper Trey Ink (PTI) cardstock in order to make sure that the tag would be sturdy to use both a gift tag and as an ornament. 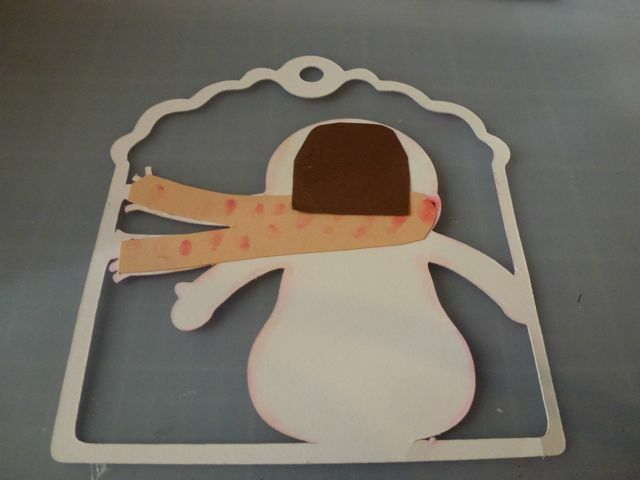 Attach the background pattern paper to the background white PTI layer first so you will have a substantial base to adhere the snowman once the glossy accents has dried. You could attach to any type of gift for almost any winter occasion – or you could keep it for yourself and be the recipient of your talent. 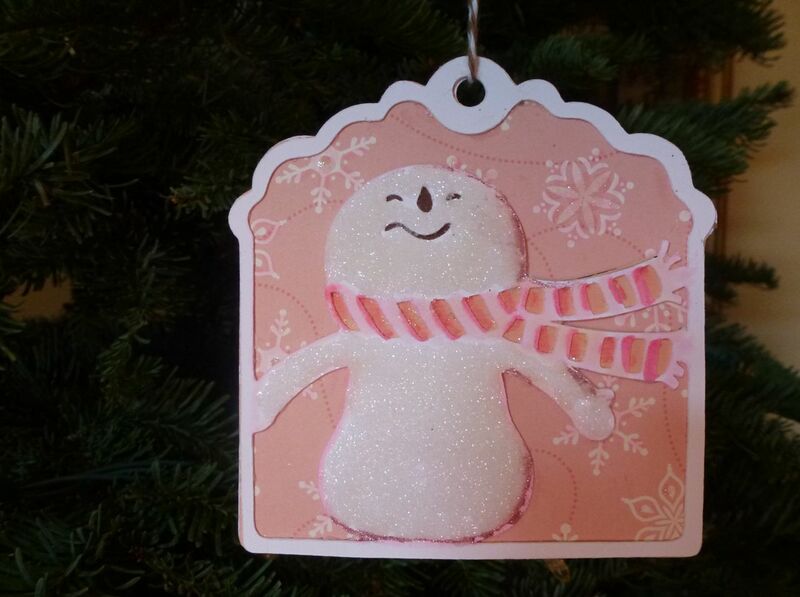 Adorable gift tag/ornament. I love the little snowman! I don’t think I’ve tried papertrey ink cardstock. I will have to keep this recommendation in mind (for if I EVER run low enough on paper to justify more). Hubby’s ready to move me into the basement. Yikes. I won’t go. Now on to this cute tag. I love this pink cardstock. You found just the right shade. Your tag has a soft, sweet look with that adorable glittered snowman and his perfect inking and sweet lil face. He’s just too cute to give away. I love your tag – it is so pretty. You are right about Papertrey Ink Cardstock – that stuff is heavy-duty cardstock! OK- how have I missed blog posts from you? I subscribe via email so there is no excuse. I just love the idea of keeping the tag to “be the recipient of your talent”. I will have to investigate Papertrey Ink Cardstock…if my inner cheapo will allow it. Adorable tag in such gentle colors! Wow… don’t know how I missed this tag two years ago when it was originally posted! But I’m going to give it a shot now if possible…thanks!